I'm warming up to the new Facebook Timeline, so I decided today to change over to the new format for my personal profile there. 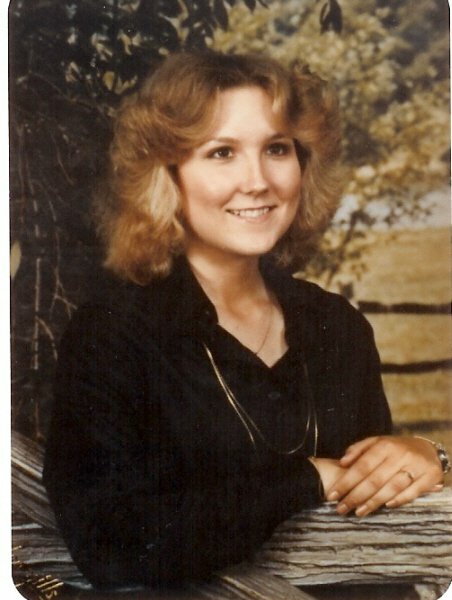 I came across an old photo of me in my twenties posted by my adopted sister through my kids. 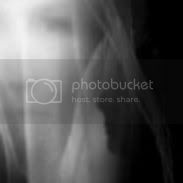 I can clearly see my Celtic and Scandinavian ancestries in my facial features, so I can easily believe that I have no Native American ancestry, in myself at least. 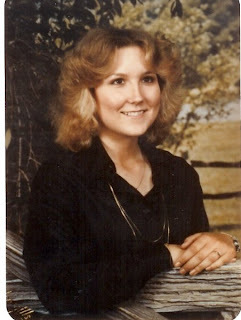 I laughed seeing my old hairstyle back in those days - ohmygawd! A chilling statistic (in follow-up to my previous post) regarding Hungarian Jewry (to which I am related) ..."During World War II, the Nazis and their European cohorts killed over six million Jews. ONE TENTH of these Holocaust victims were Hungarian Jews." This article on Malchiel Gruenwald is evidence to support the recent genetic result I received of having Budapest Hungarian Ashkenazic Jewish ancestry. It is known in my family that on my mother's mother's side we have a Jewish Grunwald family line. Grunwald is a Jewish surname still found among Hungarian Jews of Budapest (at least it was before the Holocaust). Quote from the article "although Gruenwald's own relatives were not so lucky: a third brother Philip, director of the Jewish Museum, was one of a number of Jews killed by Hungarian authorities in Budapest ..."
Philip Grunwald, this man's brother, lived in the Budapest Jewish community. Malchiel and Philip Grunwald had another brother, so while Malchiel ended up in Israel, and Philip was murdered in the Holocaust, I don't know what happened to the other brother or to the rest of the Grunwalds in Budapest, who may, in some way, be related to me. "Hungary's pre-war Jewish population was 800,000, of which 180,000 survived." I did the most extensive 27-marker genetic analysis available, along with specific population analyses (European, Middle Eastern and Native American). My United Kingdom (Welsh, English, Scottish, Irish) and Germanic ancestries were confirmed by the results. I now have to add to this European ancestral list Belgium, Sweden, Norway, Italy, Slovakia, Austria and Hungary. I was surprised by the results in that I have deep Swedish-Norse roots, an interesting and unexpected Middle Eastern ancestry (Armenian, Hungarian Jewish, Turkish, Israeli Jewish), and no notable Native American ancestry (despite oral family history). Taken all together, I can conclude that my primary genetic roots are pan-Celtic (including Welsh, English, Scottish, Irish and Belgic), Norse (including Swedish, Germanic and Norwegian), Italian, Armenian, Hungarian Ashkenazic Jewish, Israeli Jewish and Turkish. My primary Middle Eastern genetic area is circled in yellow, and the next highest 4 areas are circled (or colored - Hungarian Budapest Ashkenazic Jewry) in red. Click to enlarge. My primary European genetic area is circled in yellow, and the next highest 4 areas are circled in red. Click to enlarge. The Germanic and Ashkenazic areas overlap on the map. 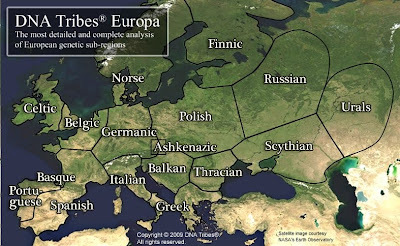 DNA Tribes® Europa is a specialized analysis that includes a detailed comparison to genetic sub-regions of Europe. The scores in this DNA Tribes® Europa report can be compared to more general world region match score information in Part D of my 27 Marker Kit report. My DNA Tribes® Europa results identify the sub-regions of Europe where my DNA profile is most common. These genetic sub-regions include both geographical territories and endogamous trans-national communities who have retained unique genetic characteristics. My top 5 European regional genetic affiliations are Celtic, Belgic, Germanic, Norse and Italian. Here is the European regional map (click to enlarge) the analyses are describing. The Germanic region overlaps the Ashkenazic region. This list identifies my DNA match scores for individual Middle Eastern populations in the database. Each of these scores can be compared with the Top 20 population match scores listed in Parts B and C of my genetic ancestry report. My top 5 in the Middle Eastern panel are Armenian (Lake Van, Armenia), Ashkenazi Jewish (Budapest, Hungary), Armenian (Sason, Eastern Turkey), Turkey and Ashkenazi Jewish (Israel). I've actually got quite an unexpected mix of blood from the Middle East it seems. Looks like my Ashkenazic Jewish ancestry is confirmed in DNA now, in agreement with oral family history (of my Grunwald family line). The surprise here is that the numbers are so high, considering that my Ashkenazic Jewish ancestry was not known by me until I was an adult, while (as shown in my previous post), I knew of my Native American ancestry as a little girl and all of those results came back ZERO. There are two numbers - basically, the one in parentheses is a TribeScore which compares my MLI scores to members of each ethnic group and world region. The second number is the MLI (Match Likelihood Index) Score which determines ranking for matches and measures how common frequent my DNA profile is in that population as compared to the world overall. Every single score was zero except for Athabaskan (Alaska) (0) which had an MLI score of 0.1, which is essential zero. Totally unexpected result. UPDATE - It seems that many Native American populations have not been fully characterized in the population database of many comapnies including DNA Tribes (where this test was done), so the oral tradition of my paternal family is not necessarily wrong. My paternal grandfather's half-sister Palace was full blooded Cherokee. World Region Match represents the most comprehensive portion of my genetic ancestry analysis. These regions are the product of long term patterns of interactions between peoples within major geographic and cultural zones over hundreds and often thousands of years. World region results provide a broader, more general view of where my genetic ancestry is found among major regions of the world. The highest score indicates my primary geographical affiliation, and subsequent scores indicate secondary regions where my blend of ancestry is present and/or possible sources of admixture. My top 5 are Northwest European, Eastern European, Mediterranean, Finnic and Aegean. These results are my Top 20 matches in a database of 1,176 global populations, including native peoples as well as Diaspora groups that expanded from their homelands and sometimes admixed with other populations in recent history. The geographical distribution of my Global Population Match results indicates my closest genetic relatives today and peoples whose blend of geographical ancestry is most similar to my own. Wow, Sweden is my top match - I would have never guessed that. My top five Deep Ancestral Origins matches - Sweden, UK, Norway, Dundee Scotland and Wales. I've already submitted my DNA samples for analysis of my mitonchondrial DNA which will reveal my mitochrondrial motherline and mtDNA haplotype. Oh, the sweet anticipation! I'm also preparing to submit my DNA for autosomal STR genetic analysis which looks at the DNA inherited by both the mother and father comprehensively. This test will tell me to which "world tribes" I belong. I'm doing the general 27-marker panel test, plus have added on three extra panels to look more closely at my European, Native American and Middle Eastern ancestry. I'm sending my samples off this week to the lab for analysis. This is all so very exciting! I can't wait to get the results! I feel like a kid waiting to open a gift. More on the new found human species, the Denisova hominins, Paleolithic-Era members of the genus Homo. From the video description, "Scientists say an entirely separate type of human identified from bones in Siberia co-existed and interbred with our own species. The finding adds weight to the theory that a different kind of human could have existed in Eurasia at the same time as our species." Modern Humans (Homo sapiens sapiens) first evolved in Africa, while Neanderthals (Homo sapiens neanderthalensis) evolved in Europe, Asia and the Middle East but not in Africa (where Modern Humans first evolved as a species roughly parallel in time with Neanderthal evolution in Eurasia and the Middle East). Given this fact of prehistory, it may be our Neanderthal blood, so to speak, which gives voice to the deep longings that we find in many peoples toward the Sacred Lands outside of Africa. In other words, since Africa is the cradle from which Modern Humans first evolved, one would expect that all Modern Humans would feel the deepest connection to Africa as a Sacred Land, but this is not the case. We have to explain why so many of us feel so essentially connected to the Sacred Lands where the Neanderthals evolved as a species distinct from Modern Humans. New scientific research has concluded that Neanderthals and Modern Humans lived side by side together in Europe, Asia and the Middle East for at least 15,000 years. Neanderthals and Modern Humans share a common ancestor. Recent genetic research has proven that up to 4% genes in all non-African people (people of European, Asian and Middle Eastern ancestry since the first migration of Homo sapiens sapiens out of Africa) are indeed Neanderthal (Homo sapiens neanderthalensis), demonstrating that Modern Humans (Homo sapiens sapiens) and Neanderthals (Homo sapiens neanderthalensis) did interbreed at some remote time in the past (probably before our chromosome 2 fused, giving us 46 chromosomes in contrast to the 48 chromosomes possessed by Neanderthals). The Neanderthal, sometimes spelled Neandertal, is an extinct member of the Homo genus known from Pleistocene specimens found in Europe and parts of western and central Asia. Genetic evidence suggests interbreeding took place with anatomically modern humans between roughly 80,000 and 50,000 years ago in the Middle East, resulting in 1–4% of the genome of people from Eurasia having been contributed by Neanderthals. The last common ancestor between anatomically modern Homo sapiens [Homo sapiens sapiens] and Neanderthals [Homo sapiens neanderthalensis] appears to be Homo rhodesiensis ... Homo rhodesiensis arose in Africa an estimated 0.7 to 1 million years ago. The earliest estimates for Homo rhodesiensis reaching Europe are approximately 800 thousand years ago when a type of human referred to as Homo antecessor or Homo cepranensis already inhabited the region. These two human types may be forerunners to European Homo heidelbergensis; however, stone tools dating from 1.2 to 1.56 million years ago of an unknown creator have been discovered in south-western Europe. This means that the spiritual roots of people with European, Asian and Middle Eastern ancestry, through our Neanderthal ancestors (and possibly through these "other" Eurasian hominid ancestors who likely also interbred with Neanderthals), may pierce through prehistory and be connected to the Sacred Lands of Europe, Asia and the Middle East as far back as 1.5 MILLION YEARS. Amazing, I think. Taking all this together, I could also go so far as to posit that it is a Modern Human (Homo sapiens sapiens) trait to feel somewhat disconnected from the Sacred Land, because what do Modern Humans do very well? We migrate, and we have migrated all over the world, driving all other hominid species to extinction in our wake. It's conceivable then, that Neanderthals were more land-connected creatures than are we, since we don't find that Neanderthals migrated into Africa (as Modern Humans migrated out of it). Modern Humans first met Neanderthals in the Middle East, where the mythic story of human beings created from the Sacred Land first arose (as recorded in Hebrew Sacred Writings and partially in the text of Genesis, for instance). I could further posit from this that the creation myth of Adam and Lilith from the Sacred Land is ultimately sourced in our Neanderthal prehistory - an encoded remembrance of sorts giving honor to our Neanderthal and non-Homo sapiens sapiens bloodline and to our connection to the Sacred Land from which our non-Homo sapiens sapiens ancestors evolved. I can continue ... to posit that the Exodus story is similarly related to the first migration of Homo sapiens sapiens out of Africa, into the Middle East and beyond. Strikingly, the "biblical migration" out of Africa leads us to encounter the Promised Land - another hint leading us toward our Neanderthal ancestry and its intimate connection with the Sacred Land. We have no religious or spiritual connection to the Sacred Land, until we meet up with the Neanderthals in the Middle East. It is our meeting up with the Neanderthals and the Neanderthals themselves who instill in us a living connection to the Sacred Land. The creation myth of Adam and Lilith from the Sacred Land, the Exodus story, and our deeply felt passion for the Sacred Land - all of these things may be Tradition stories related to our Neanderthal heritage and to the ancestral heritage bequeathed to us by those "other" European, Asian and Middle Eastern hominids who loved and lived in the Sacred Land before us. Recent genetic research has proven that up to 4% genes in all non-African people (people of European, Asian and Middle Eastern ancestry since the first migration of Homo sapiens sapiens out of Africa) are indeed Neanderthal (Homo sapiens neanderthalensis), demonstrating that Modern Humans (Homo sapiens sapiens) and Neanderthals (Homo sapiens neanderthalensis) did interbreed at some remote time in the past (probably before our chromosome 2 fused, giving us 46 chromosomes in contrast to the 48 chromosomes possessed by Neanderthals).